"It would be ... better on Sunday," Woods said after his 5-under 66 to get back into the mix. "But I'm right there." His 66 wasn't even the best of the day — Justin Rose shot 64, Jordan Spieth and Francesco Molinari 65s — but it likely was what fans were talking about when they left the course. It left Woods tied for sixth place on 5-under overall, four shots off the lead and in contention for his first major in 10 years. "It's been a few years since I've felt like this," Woods said. The sun was peeking out of the clouds and Woods was walking up the first fairway when one spectator, a beer in his hand, shouted: "Go on Tiger, we got your back." "You're the man, Tiger, everyone knows it," shouted another spectator flanking the fairway on the sixth hole. And Woods' playing partner sensed an aura around the 14-time major champion. 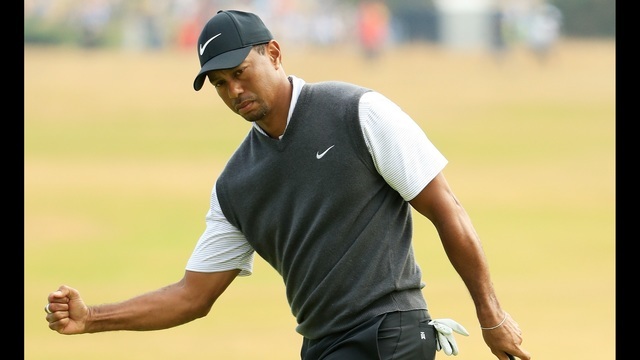 Woods was "back at the top of his game," said Shaun Morris, who got Woods to sign four new gloves after the round and planned to give them to his friends back home in South Africa. Ian Poulter, who missed the cut, tweeted a screen-grab of the leaderboard with Woods' name on top, and wrote: "I can't say I've ever been so excited for Tiger Woods before.. If he can pull this off, it would be 'stuff dreams are made of.'" Woods will be in the third-to-last pairing, with Francesco Molinari. "It certainly is possible," Woods said. "I've shown that I've been there, close enough, with a chance to win this year. Given what happened the last few years, I didn't know if that would ever happen again, but here I am with a chance coming Sunday in a major championship. It's going to be fun."